Engaged Public is a consulting firm based in the U.S. that specializes in promoting citizen engagement in public policy, including government budgets. Their online tool Balancing Act was developed to help teach U.S. citizens how budgets work and to capture citizen input on budget priorities. Recently Engaged Public began working with governments and civil society outside the U.S. to trial the tool. While IBP doesn’t endorse any particular tool or approach, we are always interested in understanding new ways of making budgets more open and accessible. We recently talked with Brenda Morrison from Engaged Public about Balancing Act and their work in adapting the tool to different country contexts. IBP: Part of your work is to try to get the public more involved in government budgets and you created Balancing Act. Can you tell us a little about how it works? Brenda Morrison: Balancing Act is an online interactive budgeting tool that gives citizens and governments a chance to collaborate more closely on one of the most important set of decisions a government makes, the budget. While most governmental entities in the U.S. are required to have some kind of public meeting on the budget, it is often poorly attended and budget proposals are presented in an inaccessible, dry format. People in the U.S. are used to both obtaining and interacting with information at a touch of a smart phone, so it is imperative that government integrate equivalent tools that foster accountability through providing for transparency and engaging the public. Balancing Act is a tool that can help accomplish all three of those objectives. At its core the tool promotes participation from both government and citizens. Governments can readily grasp the budget priorities of constituents by analyzing the machine-readable data captured by the tool, while citizens and CSOs can use Balancing Act to learn about proposed budget policies and advocate for changes. IBP: A number of city governments in the U.S. have adopted the tool. What has the response been from the public in those cities? How have policymakers reacted? Brenda Morrison: The public and the policymakers have responded positively. The city of San Antonio used it for a second straight year, integrating it into its very robust Speak Up San Antonio budget project. Nashville’s Mayor Megan Barry announced Balancing Act on her Facebook page and within 24 hours there were 1,200 users on the site. And here in Colorado, two K-12 education advocacy groups have licensed the tool in order to create awareness and educate the public about the state of education funding in Colorado. IBP: You have also been piloting the tool in a number of developing countries. Have you been working with mainly civil society, governments, or both? Can you tell us a little about what the response has been? Brenda Morrison: In partnership with the Financial Services Volunteer Corp (FSVC), a colleague and I have tested Balancing in both Tunisia and Jordan. We’ve worked with both the national and local governments and with representatives from civil society organizations, such as Partners Jordan. In Tunisia we found municipal governments were open to learning about how to integrate CSOs and others into the process of developing budgets. While in Jordan we demonstrated how an online tool such as Balancing Act can be integrated into an annual plan so CSOs can regularly provide input into the Citizens Budget. IBP: The Open Budget Survey 2015 ranked the U.S. among the top performers on budget transparency. In many countries, there is a lot less budget information in the public domain and a lack of access to disaggregated data is a particular problem. Has budget transparency been a constraint to your work? Brenda Morrison: Yes. There are two challenges. First, obtaining the budget, and second the accuracy of the numbers. In the U.S. budget information is readily available for all levels of government, even if it’s not presented in an accessible, easy-to use manner. Also, we generally don’t question the accuracy of the numbers. In some countries, there may be skepticism as to whether the government is presenting an accurate budget. However, in both the U.S. and in the countries we’ve worked in so far, we have found that it is often the case that people don’t care about the budget until they understand how it impacts them directly. Unfortunately, they often don’t have enough information to address the situation in a meaningful manner. Although it may be a lofty goal, it is our hope that our tool motivates and allows more citizens to be informed about how their government raises and allocates resources. IBP: The name “Balancing Act” could be about balancing competing priorities with limited resources, or could be seen as alluding the idea of a balanced budget. In your experience, do citizens tend to try to balance the budget when using the tool? Is the budget deficit discussed when you present the tool to people? Brenda Morrison: We do discuss it when presenting the tool, as most of us have a hard time wrapping our head around the enormity of the deficit. Users do try and balance the budget, but quickly discover the challenges that our lawmakers face. Many people are surprised that the true drivers of the U.S. federal budget are social security and healthcare (both Medicaid and Medicare), and not some of the budget items that are often highlighted by elected officials. What is gratifying to us is that every day we see that a university or high school class is utilizing the federal version of Balancing Act to teach students about our government. One high school civics teacher from the state of New York has even created a lesson plan centered around Balancing Act in order to teach the federal budget. IBP: But the deficit is a politically contested issue in the U.S., and it’s easy to present information in ways that favor a particular viewpoint. You worked with the Bipartisan Policy Center to model the U.S. federal budget, but how will you approach these issues in other countries? In particular, who gets to decide on tweaks to the tool? Governments? Civil society? A combination of both? Brenda Morrison: Good question. In some circumstances, it could be very beneficial for a CSO and a government to jointly sponsor Balancing Act. The government provides the data, works with the CSO on the narrative, and the CSO disseminates the information to the citizens via their networks. It could be a win for both government and CSOs. I can also see a scenario in which the government will be supportive of a CSO’s effort to use Balancing Act but choose to work behind the scenes. If the data is accurate, that scenario is entirely plausible. IBP: Pew Research found that, as of 2015, more than 80 percent of Americans had access to the Internet. In many developing countries a far lower percentage of people are online, and a disproportionate amount of poor people are on the wrong side of the digital divide. 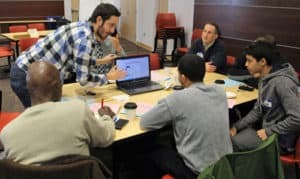 Given the importance of engaging poor and marginalized communities in government budgets, is there a risk the tool could cut people out of the conversation? Have you found that this is a concern among the governments and CSOs you’ve spoken to? Brenda Morrison: Of course this is always a concern. Engaged Public specializes in bridging the gap between policy and people, and still believes that there is no substitute for quality face-to-face interaction. We are happy to train representatives of CSOs in effective budget facilitation without the use of any technology. However, this quarter we will be releasing a module to Balancing Act called “Meeting Mode” that will make it possible to use Balancing Act as a facilitation tool for structured conversations about the budget. Meeting Mode will allow event sponsors to select areas of the budget for the group to focus on and then to display, on a special facilitator screen, all responses in real time. Budget officers, elected officials, and other staff can immediately see the results and can use them for a back and forth conversation on specific items. Our goal at Balancing Act is to make budgets accessible so that people can understand them, interact with them, and ultimately to support them. The app does a great job doing this for individuals; but Meeting Mode will make it possible in the types of settings — town hall meetings, work sessions, hearings — where decisions in a democracy are made. To learn more about Engaged Public’s Balancing Act tool, click here.